Muslate.com is an internet based start-up which provides its users a platform where they can upload their music to Muslate Music Database and can organize it by using various options like creating playlists etc.. For every song that they upload on the site, they are awarded with MuPoints which can be redeemed later on for some goodies. Users can access their music anytime, from anywhere by just logging in to their account on the site. Muslate provides all of these services without any subscription charges. Muslate is based on concept of mutual music sharing. So, users will not only be using their uploaded music for themselves, but will also be able to share it with other Muslate users. Once Muslate Music database grows to a considerable size, users will be able to search a music track in the complete database and if available will be able to add that track to their music collection. To add a song into music collection, which is uploaded by someone else, user will have to pay MuPoints to the original uploader/owner of the song. So users will be able to share/buy music by using their MuPoints, which they will get on uploading music to the database. So, more a user upload, more he can buy/share. Many sites do provide the option of listening music online, but they have a limitation that people with specific music interests or language preferences don’t get those tracks in their database. 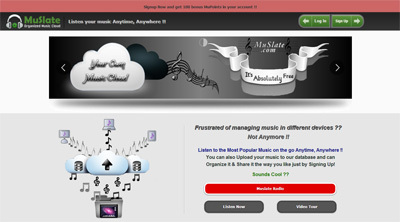 As Muslate lets users to upload any kind of music so people with specific music preferences can also become a part of Muslate and can have their music organized online. The website will also provide its users the unique feature/style of music sharing (using MuPoints) so that each user has access to a plethora of music.